The European elections are coming up again. In the week from 21 to 28 May 2019, every European citizen over the age of 18 will be able to make his or her voice heard. 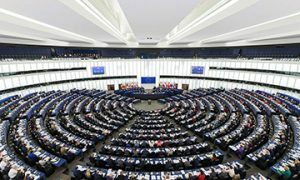 In the run-up to the elections, Maastricht University’s ITEM Expertise Centre will organise a major Student debate with European parliamentarians on 14 May 2019. Please register before 4 May (limited amount of places is available). Register via the ITEM website and Facebook event page. During the debate you can express your opinion on important themes in Europe, such as working and studying at home and abroad and security and migration in Europe. What will this look like? During the debate, students will bring their views forward by means of a pitch. The European parliamentarians will respond, after which a debate can erupt between you, your fellow students and the politicians. So it’s up to you to decide on the content of this debate! Not sure yet which topics you think are important for the upcoming elections? Have you always wanted to know how Brussels thinks about important issues? Do you want to make a substantive contribution to Europe and the European Parliament? Then you don’t want to miss this Student debate! Mark 14 May in your diary. Keep an eye on the website and Facebook or follow ITEM via Twitter and/or LinkedIn. Foreign student in the Netherlands? Do not forget to register yourself before 10 April via a Y32-form at your municipality in order to bring out your vote for the upcoming European elections.